Wilbur Ross: Will remain IAC's chairman emeritus. 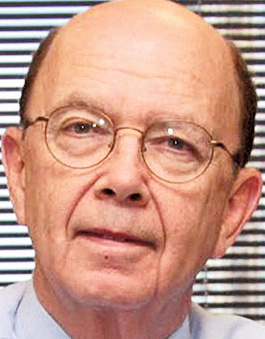 DETROIT -- Wilbur Ross, the billionaire turnaround artist who launched International Automotive Components Group in 2006, is stepping down as IAC’s board chairman to take a senior position at the Bank of Cyprus. Ross, who will be the bank’s new vice chairman, resigned from IAC’s board because the European Union restricts the number of directorships that a bank officer may hold. Stephen Toy, currently an IAC director, has been named chairman. Patrick Machir, a principal at WL Ross & Co. who has worked with IAC management since 2006, will join IAC’s board. Ross will remain chairman emeritus while company CEO James Kamsickas will remain in his current role, according to a statement. In 2013, IAC generated revenues of $5.2 billion from its portfolio of door panels and interior components. Headquartered in Luxembourg, the company employs more than 30,000 workers in 21 countries. The company has yet to carry out plans announced last year to launch an initial public offering.